This is the fourth book that I've read by Gareth P. Jones, but yet again, he has produced something different. He appears to have the great ability to experiment with different genres and develop the style of writing to fit the concept of the storyline, and that is what I particularly love about this author. Each book is written with outstanding imaginative qualities - great plot driven stories and a host of interesting characters that you will love. The big question is . . . . . . what can we expect from this book? 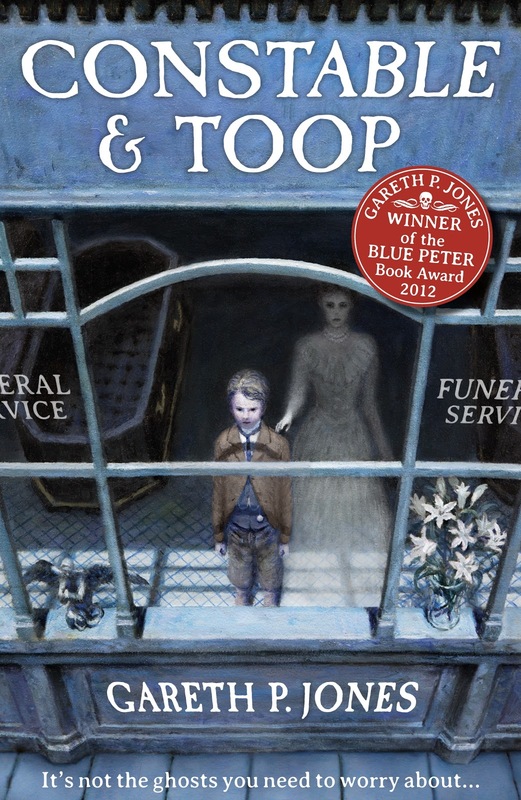 Constable & Toop is the story of Sam Toop, who lives in a funeral parlour and has the ability to see and hear every ghost in London, but trouble is afoot on the ‘other side’ when a ghost clerk called Lapsewood discovers a horrible disease mysteriously imprisoning ghosts inside empty houses. In a nutshell, this is a ghost story set in Victorian London (1884) - one of my all time favourite settings. Constable & Toop is the name of the funeral parlour and features as one element of this unusual story. The first sentence in the book sets the tone very well . . . . In her last few moments of life, as the blood gushed from the knife in her neck, Emily Wilkins found her thoughts drifting to her mother's death. After such an appetiser you will definitely want to find out more. The book follows two sets of interlocking adventures; Sam in the here and now world and Lapsewood on the "other side". Both will have you captivated as both worlds collide and produce one brilliant story. Each world features poignant moments involving death as Sam encounters ghosts through his ability to see and speak to them. However, there are also many moments that will leave you chuckling as some of the characters will really make you laugh. Lapsewood's Sidekick, The Marquis, was my favourite character in the book as he was absolutely brilliantly. In fact he should really should have his own book. Mr Jones does not patronise his readers; they have to cope with some really harrowing and gruesome moments, which makes him one of the best writers in my opinion. This is a rapid ghost adventure peppered with many interesting events that will have you wanting more. The attention to detail makes this story stand out from amongst the book crowd. This is a great book that will set your imagination on fire. It is one that you will definitely remember for time.